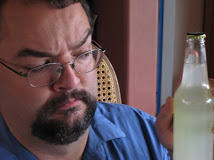 The Weird Soda Review Lab used to be headquartered in Los Angeles, where I would make occasional forays into the realm of Whole Foods Market. You've probably been there too; lots of organic/whole-grain/healthful foods, many of which contain flax. Good stuff, mostly. It was at Whole Foods that I began my love affair with Natural Brew. Natural Brew makes a line of cane sugar sodas which are often quite splendid. I am most familiar with their vanilla cream soda (*sigh*...have to review that soon...), but the Kibbitzer-in-Chief recently brought home one of theirs I hadnt seen before: the Ginseng Cola. I'm not extensively familiar with ginseng, and while cola is fine with me it's not on the top of my list. But this is from Natural Brew; I'm game. Color: medium caramel brown, a nice garnet with light coming through it. Pretty much looks like a regular cola. Scent: Spicy rich cola, reminiscent more of RC than Pepsi or Coke. I can't smell anything which jumps out and screams GINSENG!, but there is an interesting siciness to it. Taste: Hmmm...the cola is there, with the usual tart undertone. Pretty sweet, not as much direct bite as some, with a little more complexity. The sweet taste fades moderately slowly, with the tart lingering a bit longer. It's a lemony tart. I think I can taste the ginseng--a gingery, high spice, with a sharp edge, volatile in the nose. The K-i-C says that ginseng has an earthy tone to her--I can taste that, I think. The ginseng is getting stronger with time, probably as it warms up. That's mostly a good thing, but it's giving it a more distinct character. K-i-C: "It's like a mix between a vanilla Coke and some ginger ale." Just right. The middle taste, after the cola bite, reminds me of Vernor's a bit. Quaff rating: 4. Quite nice, mild and mellow. Cough rating: 1. The ginseng gets strong; if you didn't like ginseng, it would be harsh.